Mind 2 Mind is a free youth program to those who live in the East Hillside and Endion neighborhoods of Duluth, Minnesota. Mind 2 Mind provides quality youth development opportunities, focusing on areas of academic achievement, social and life skill development, health and wellness, and advocacy for the youth and their families. Paid staff and college volunteers provide the children with positive role models as well as assisting them with their homework. We incorporate the arts, nature,and the importance of contributing back to the community through our structured educational programming. Diversity is celebrated in an environment that promotes positive growth for each child. Our youth programs have been very successful and have provided approximately 60 children per year with adventures they most likely would not have been able to participate in otherwise. Our Mission is to work with East Hillside/ Endion residents and organizations to make their neighborhood a good place to live. We do this by supporting academic achievement and social development of diverse low-income neighborhood youth. Our Goals are to have a safe environment for supporting youth by providing positive role models as instructors and staff on a daily basis through mentoring, tutoring, and enrichment activities, and maintaining parental and East Hillside community involvement in the program. 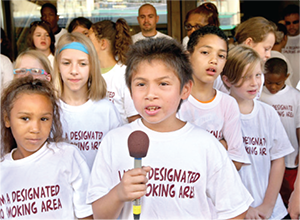 The Duluth City Council banned smoking within 15 feet of DTA bus transit shelters thanks to the efforts of the kids from the East Hillside Patch who spent part of their summer surveying bus riders. The kids found that 83 percent of riders felt smoking and secondhand smoke were problems at outdoor bus stops. The kids were able to successfully lobby the City Council and were directly responsible for a new law on the Duluth books. This benefits anyone waiting for a DTA bus and also is a reminder that any of us can make a difference in our community. The new law is all about improving and preserving health. It's about helping to make sure "people live longer, happier lives," as 12-year-old Tracy Onchwari, who testified before councilors, said. Duluth became the first city in Minnesota to pass such an ordinance and is among the first cities in the country with one.